"He can win an election," an opposition newspaper groused about its nation's first black President, but can he run a country? The subject of this headline was not Barack Obama in 2008 but Nelson Mandela in 1994. He emerged from 27 years as a political prisoner to be voted into South Africa's highest office, ending decades of apartheid in a lightning flash of popular will. All he had to do was end crime, create jobs ... and help the nation's hapless rugby team, the Springboks, win a world championship. Invictus, which takes its title from the William Ernest Henley poem ("My head is bloody but unbowed") that gave Mandela strength in jail, has all the vectors of the sports-inspirational genre. 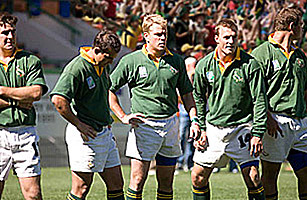 There's the impossibility of the odds, the father figure whose quiet fervor wins over the players and the fans, the star athlete (Damon as Francois Pienaar) who spurs his teammates to victory with a rousing speech: "Listen to your country ... This is our destiny." What gives heft to the clichés in Anthony Peckham's screenplay, based on the John Carlin book, are the identity of the "coach" and the high stakes involved. Mandela believes that if all his citizens can becomes adherents of this national team  long a symbol of apartheid  then the country might truly be united. If there's a whiff of colonialism in casting Hollywood stars as renowned South Africans, the actors work hard to find strength and nuance in their roles. Damon, beefed up for the occasion, makes Pienaar a stalwart yet courtly figure. Freeman infuses Mandela's speeches with the same gentleness and gravity he's brought to his numerous God roles and the Visa Olympics commercials. But the real deity here is Eastwood, still chugging away handsomely in his 80th year. Who'd have thought that old Dirty Harry would, with Letters from Iwo Jima and Invictus, become America's prime director of international trauma and triumph? See the 25 most important films on race.